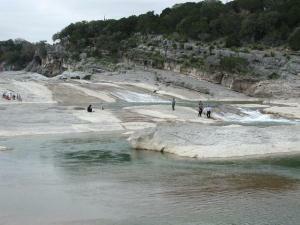 The Hill Country is one of the prettiest regions of Texas. Hill Country Explorer is your guide to the interesting places that will get you outside and into your own adventure. Find a trail to hike or a site to visit and keep track of them all and share your experience with others. Purgatory Creek Natural Area - This natural area provides about ten miles of trails on fairly rough surfaces just a few miles from the center of San Marcos. Austin Athletic Club - The debate is settled about the ultimate fate of the 70-year old Austin Athletic Club building, the first recreation center in Austin. The wrecking ball has declared it to be "game over"! Cemeterio Guadalupe - Many of San Marcos' Hispanic community have made their final resting place here.